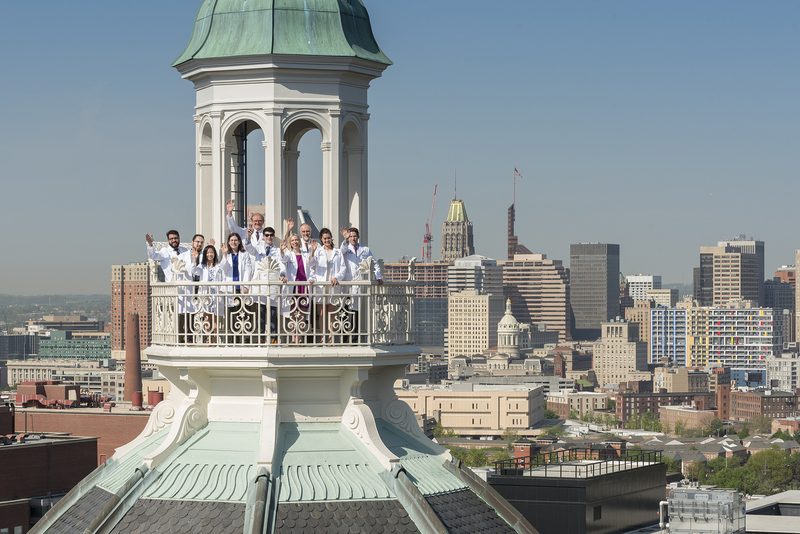 The Department of Pathology at Johns Hopkins provides in-depth training in anatomic pathology (AP) and clinical pathology (CP), either combined or individually, to newly graduated M.D.s and those with previous postdoctoral experience. The program is designed to train a well-rounded pathologist through extensive clinical and research experience. House officers receive training in diagnostic anatomic and clinical pathology in a setting of clinical and academic excellence. The department also offers a combined anatomic pathology (AP) and neuropathology (NP) track. Our residency has been variously ranked #1 or #2, and is currently ranked #1 in reputation by Doximity. Residents selecting combined AP and CP training have a fully integrated four-year program developed for their particular interest. In the first two years, all residents are exposed to the major divisions of anatomic and clinical pathology. The first year focuses on AP training, including autopsy, surgical pathology and cytopathology, as well as some CP training. The second year emphasizes introductory rotations in CP. 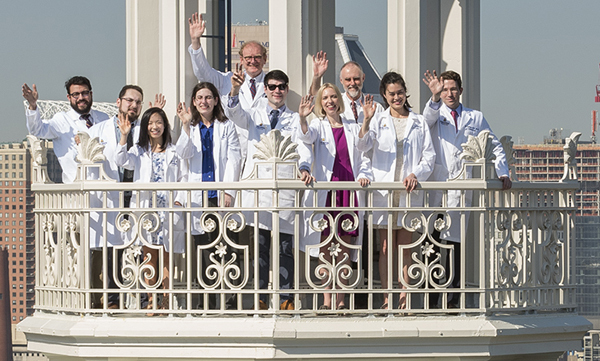 In the ensuing two years, the residents take advanced and elective rotations in both anatomic and clinical pathology. 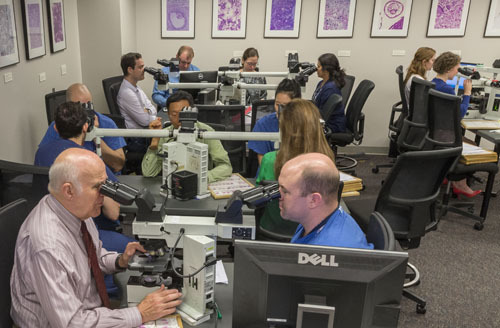 The final year of training provides substantial responsibility in anatomic and clinical pathology, and plenty of opportunities for advances electives and research. 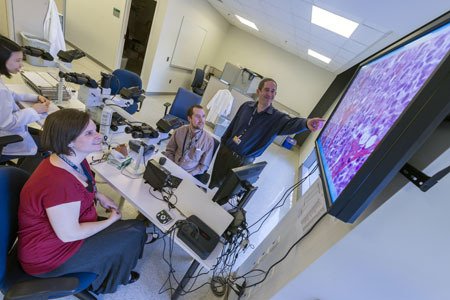 During the residency, there are multiple elective opportunities for training in the pathology of specific systems, including dermatopathology, neuropathology, renal pathology/electron microscopy, and immunohistochemistry. Most of our AP only residents also elect to have some research experience, that in some cases includes an additional funded year for dedicated research. Numerous endowed funds and a T32 training grant are available to support these research efforts. The emphasis in CP is diagnostic interpretation of laboratory tests, interaction with clinical services, and understanding of technical methods, instrumentation, information systems, quality assurance and laboratory management. Additional training consists of rotations and electives that provide further experience in select areas and opportunities for research. Weekly didactic sessions in both Anatomic and Clinical Pathology. Weekly surgical pathology case conference. Daily and weekly multiheaded microscope and didactic conferences in surgical pathology and in specialty areas. Weekly work rounds and weekly seminars in clinical pathology. Weekly grand rounds with presentations by faculty, fellows and guest lecturers from within and outside the institution. Residents selecting combined AP training have a fully integrated three-year program developed for their particular interest. In the first two years, all residents are exposed to the major divisions of anatomic pathology. The first year focuses on AP training, including autopsy, surgical pathology and cytopathology. In the ensuing two years, the residents take advanced and elective rotations in anatomic pathology. The final year of training provides substantial responsibility in anatomic pathology. 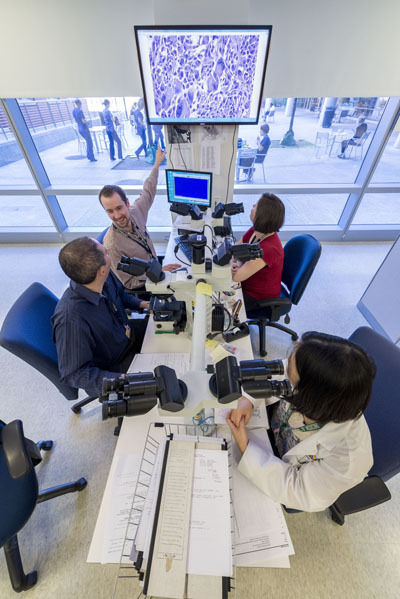 During the residency, there are multiple elective opportunities for training in the pathology of specific systems, including dermatopathology, molecular pathology, neuropathology, renal pathology/electron microscopy, and immunohistochemistry. Many of our AP only residents chose a more intense research experience that includes electives in research, and in some cases a funded year for dedicated research. Numerous endowed funds and a T32 training grant are available to support these research efforts. Weekly didactic sessions in Anatomic Pathology. Residents selecting CP only training have a fully integrated three-year program developed based on their particular interests with assistance from their faculty mentor. 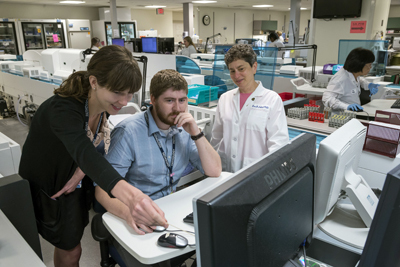 In the first two years, all residents are exposed to the major divisions within Clinical Pathology, with rotations in Chemistry, Hematology/Coagulation, Medical Microbiology and Transfusion Medicine. More specialized experiences are also provided in Hematopathology, Immunology, and Molecular Pathology/Cytogenetics. In the third year, the program includes sufficient time for electives and research allowing the CP only resident an opportunity for further specialization. This final year of training provides substantial responsibility in clinical pathology with leadership in the laboratory. Many of our CP only residents chose a more intense research experience that includes electives in research, and in some cases a funded year for dedicated research. Numerous endowed funds and a T32 training grant are available in the Department to support these research efforts. principles of laboratory management, including the role of the medical director, information systems, and quality assurance. Weekly didactic sessions in Clinical Pathology. Weekly work rounds addressing the on-call and consultative role of the clinical pathologist. Weekly seminars in clinical pathology. Quarterly quality improvement forums for residents, providing additional exposure to quality assurance and quality improvement activities. All house staff participate in the teaching of the pathology course for medical students. Residents have assigned days to teach small groups of students in collaboration with faculty members. CP residents also provide continuing educational experiences for the technical staff in the clinical laboratories. Throughout the training program, residents assume progressively increasing responsibility for the management of cases under the close supervision of senior residents, fellows and attending faculty members. Two residents from the Pathology program are selected to serve as the Chief Residents in Pathology. Our department offers several fellowship programs allowing for further specialized training. Recent graduates hold faculty positions in top academic institutions. 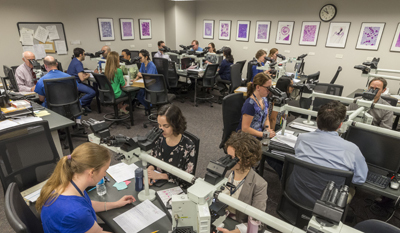 Residents selecting the AP/NP track will undergo rigorous training in anatomic pathology and neuropathology in a fully integrated four-year program developed for their particular interest and leading to AP/NP Board eligibility. The first two years consist of 24 months encompassing the core disciplines of anatomic pathology. 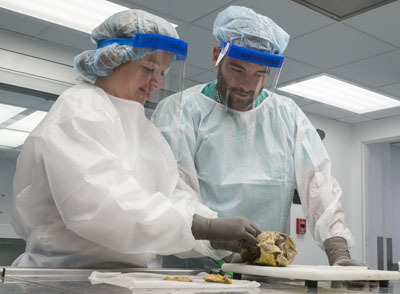 In the second two years, residents work as neuropathology fellows and focus exclusively on neuropathology, with 21 months of rotations covering surgical, autopsy, and forensic NP as well as neuromuscular and eye pathology. 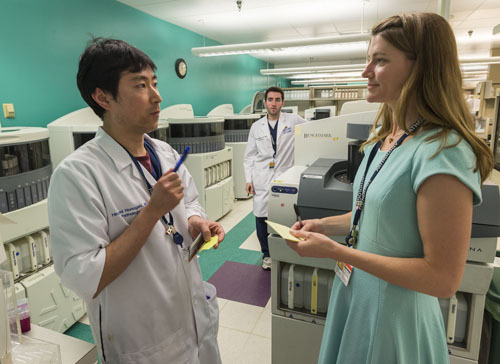 The final year of training provides substantial responsibility in neuropathology, leadership opportunities and at least 3 months of elective or research time that may be tailored to the fellow's clinical and/or research interests. While research is emphasized and supported, development of the knowledge base and skill set necessary for independent work in diagnostic anatomic and neuropathology is paramount. 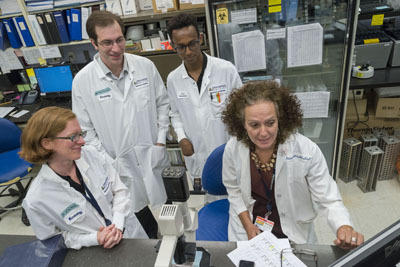 Previous trainees have built on this foundation in successful careers involving various combinations of surgical pathology and clinical neuropathology as well as research into tumor biology, mechanisms of neurodegeneration, and nervous system development. For individuals interested in developing a career as independent investigators, additional training opportunities are available through R25 and T32 grants. (Neuropathology Training Opportunities, Fellowship Training Programs). Daily and weekly multi-headed microscope and didactic conferences in autopsy and surgical pathology and in specialty areas. Weekly didactic sessions in neuropathology.